It is my earnest hope that no reader is going to wonder why this writer wants them to remember Halloween! October 31st, and specifically October 31, 1517, is the date of the beginning of the Protestant Reformation. On this date, an obscure Augustinian monk by the name of Martin Luther nailed ninety-five theses to the church door in Wittenburg, because that was the usual custom of advertisement for the people’s attention. It was the twenty-first century bulletin board. Luther nailed them up at noon sharp because it was the time of the most frequent feasts. Professors, students, and the common people would be coming from all four corners to the church, which was filled up with relics for transfers of credit. A lot of Protestants, while hearing of this incident of the nailing of ninety-five theses, think that they were ringing endorsements of Protestant theology. In reality, they were more Roman Catholic than Protestant. There is no protest against the Pope and the Roman Catholic church, or any of her doctrines, not even against indulgences. They were silent about justification by faith alone. They were primarily opposed to the abuse of indulgences. But while the form is Romish, the spirit and aim is Protestant. They represent a state of transition between twilight and daylight. We must read between the lines, as the leaders of the Roman Catholic church did in the sixteenth century. As they did, they saw a logical drift which sought to undermine the whole fabric of Romanism. Luther hoped that there would be a scholarly debate of the abuse of indulgences. But no one came to debate him. Instead, with the recent invention of the printing press, the copies of the ninety-five theses were sent all over the empire. The pope had a copy within two weeks. The common people read them and rejoiced over them. Luther was the talk of Germany. There was a trumpet call being sounded for what later on became the Protestant Reformation. Words to live by: In less than five years, in 2017, we will celebrate the five-hundredeth anniversary of the Protestant Reformation. Will there be a revival of its themes in your church and more important, in your heart, such as Scripture alone, Christ alone, Grace Alone, Faith Alone, and Only to the Glory of God? That sums up what Luther, and Calvin, and Knox thundered to the masses and the visible church. Reflect on the story of Martin Luther and the Protestant Reformation in your heart, home, and church. What better reason for remembering this day. No, not Halloween. Rather, October 31st, and specifically October 31, 1517, as it marks the date of the beginning of the Protestant Reformation. 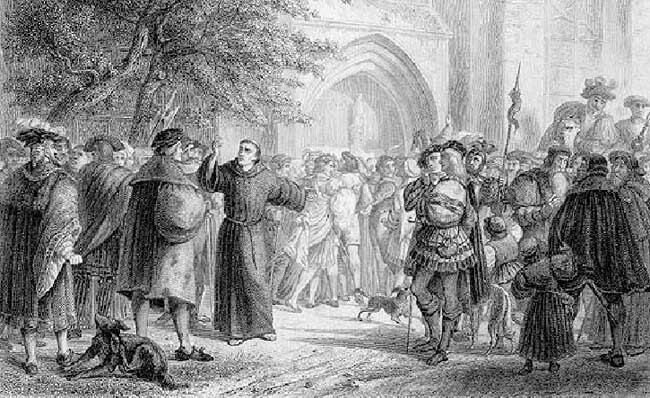 On this date, an obscure Augustinian monk by the name of Martin Luther nailed ninety-five theses to the church door in Wittenburg, because that was the usual custom of advertisement for the people’s attention. It was in effect a public bulletin board. Luther nailed the document up at noon sharp because that was the time of the most frequent feasts. Professors, students, and the common people would be coming from all four corners to the church on “All Saints Day,” for that was a time when it was filled up with relics for transfers of credit or “merit” under the Roman Catholic system. Samuel Miller was born in Dover, Delaware on October 30, 1769. As was typical for his day, he studied theology privately in preparation for the ministry. Upon completion of his examinations he was ordained by the Presbytery of New York on June 5, 1793 and installed as pastor of the First Presbyterian church of New York City, where he then served from 1793-1801. 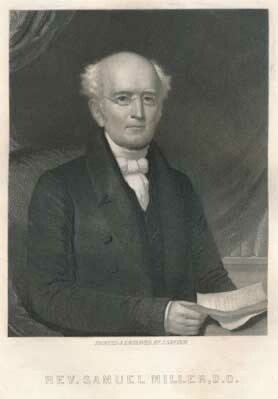 He next served the Wall Street church from 1801-1813, before answering the call of General Assembly to serve as professor of ecclesiastical history and church government at the Princeton Theological Seminary, Princeton, New Jersey. As the second professor at the Seminary after Archibald Alexander, Miller served the Seminary from 1813-1849, finally taking emeritus status at the age of 80. He died less than a year later, on January 7, 1850. Resting behind the simple facts of our first paragraph is the spiritual depth of this man of God. Upon taking the new ministry at Princeton, he sat down and wrote out seven resolutions. We don’t have space for all seven of them, but the first one stands out and indeed sums up all the rest. It reads, “I will endeavor hereafter, by God’s help, to remember more deeply and solemnly than I have ever yet done, that I am not my own, but Christ’s servant; and, of course, bound to seek, not my own things, but the things which are Jesus Christ’s” That says it all with respect to the character and conduct of this seminary professor. Words to Live By: Samuel Miller’s first resolution is but a summary of those words written down by the Apostle Paul, in 1 Corinthians 6:19 , when he stated in the context of the need to live a moral life, the following: “Do you not known that your body is a temple of the Holy Spirit, who is in you, whom you have received from God? You are not your own; you were bought with a price. Therefore honor God with your body.” (NIV) Whether soul or body, each of us should make Samuel Miller’s resolution our own resolution, and indeed recommit ourselves to it at pivotal points of our life, such as our birthday. It would be exciting to see what God would do with such a committed Christian if this is true of you and me. Smectymnuus! What? Who? What rational parent would give his kid this confusing name? Yet it wasn’t a birth name. It was rather the nom de plume framed by the initials of five authors to a book against episcopacy in seventeenth century England. To be exact, this was 1641 and the book itself had a title which may well be one of the longest titles in existence, ever! It was “An Answer to a Book entitled, An Humble Remonstrance in which, the original of Liturgy and Episcopacy is discussed: and Queries proposed concerned both. The Parity of Bishops and Presbyters in Scripture demonstrated. The Occasion of their Imparity in Antiquity discovered. The Disparity of the Ancient and our modern Bishops manifested. The Antiquity of Ruling Elders in the Church vindicated. The Prelatical church bounded.” It would seem to this writer that the outline of the book was put into the title thereof! Oh yes, and it written by Smectymnuus or S(tephen) M(arshall), E(dmund) C(alamy), T(homas) Y(young), M(atthew) N(ewcommen), and W(illiam–rendered as “UU“) S(purstow). Our attention today in Presbyterian History is on the “E” and the “C” of the title, or on Edmund Calamy, known as Calamy the Elder. 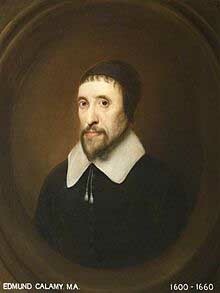 Born in London, England, in February 1600, day unknown, he was educated at Pembroke Hall, Cambridge. England. He pastored and lectured at three Anglican churches from 1626 to 1639 when he was chosen to serve as the pastor of the London church of St.Mary Aaldermanbury. In most of these parishes, he conformed to some of the ceremonies of the Anglican tradition, like bowing when the name of Jesus was mentioned, but resisting other practices of the Anglican liturgy. Indeed, he was a Presbyterian delegate at the Savoy Conferences between April and July in 1661, attempting to find some compromise in the liturgy of the Anglican Church. He, along with the other authors of the above title, were members of the Westminster Assembly of Divines from 1643 onward. With the passing of the Uniformity Act of King Charles II, the Rev. Edward Calamy was one of 2400 Presbyterians and Puritans who were ejected from his pulpit. He preached his farewell sermon to his congregation at St. Mary’s on August 17, 1662. Calamy continued to worship at the services of his old church. Once the appointed preacher did not attend the worship service, he was prevailed upon by his old congregation, and so took the pulpit and preached “with some warmth,” it was reported. Arrested for disobeying the Uniformity act, he was imprisoned for a time on January 6, 1663. He was freed later by the king and closed out his public ministry. He survived to witness the terrible fire of London in 1666, which catastrophe contributed to his death when he saw his last congregation in ruins from the fire. He died on this day, October 29, 1666, and was buried in the ruins of the church as close as his mourners could guess was the place of the pulpit. Granted! After the final victory over the British military forces at Yorktown, Virginia, there were celebrations being held everywhere in 1781 in the United States. But one of those celebrations took place in the First Presbyterian Church of Trenton, New Jersey on October 27, 1791. And this was no sparsely attending worship service. The Revolutionary War Governor, William Livingston, the Council of the state of New Jersey, the entire Assembly of Representatives, and citizens of the town came together to hear the Rev. Dr. Elihu Spencer delivered a discourse adapted to the occasion. The pastor of this church, Elihu Spencer, was no stranger to the vicissitudes of the Revolutionary struggle. Indeed, he was the chaplain to colonial troops in the long battle for liberty. As such, he was a marked man by the British and his parsonage suffered damage as a result of his affiliation with the Continental army. Two revolutionary battles were fought in Trenton, including the famous midnight crossing of the river to do battle with the German mercenaries, or Hessians, in the town, which battle Gen George Washington and his troops won, bringing new morale to the American citizenry. This celebratory day began with the beating of drums. The American flag was displayed throughout the town. At eleven o’clock, this worship service was held. In the afternoon, after artillery discharges, there came a series of toasts to everybody and anybody by the assembled political and general citizenry. In fact, it was good that they began with a worship hour, because had they done it after these toasts, none of them would have been able to stand up and sing praises to the Lord! There were many, many toasts of gratitude to those who brought about this victory. The night of celebration was over by 7 p.m. and the whole town was illuminated by candles in the evening. Words to live by: Today in our secular culture, post-Christian era, the idea that you mention that God is the God of war, or the God of battles, or the One who brings victory over your enemies, is considered anathema. Yet our forefathers did not think so, and frequently mentioned the God of providence in the events which made up our country. We need to return to the God of our Fathers, in conversation, in conduct, in celebrations of liberty by our people, in concerns of patriotism in our assembly halls — in all of life. Without Him, we would be a defeated people long ago. Something for all of us to consider. Learning to Wait Upon the Lord. The Rev. 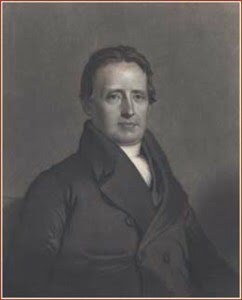 Jacob Jones Janeway [1774-1858] was an early Philadelphia pastor who served initially as an associate alongside the Rev. Ashbel Green. Rev. Janeway was also a close friend and supporter of the early Princeton Seminary faculty. A separation of the two churches was under discussion. As the one in the Northern Liberties had increased, and was now able to sustain the gospel, Dr. Janeway was in favour of the movement. It drew from the people in the new church, expressions of the most ardent attachment, and they urged as their chief objection, their unwillingness to leave his pastoral care. The Presbytery confirmed the separation, and dissolved the pastoral relation. Dr. Janeway was appointed to organize the First Presbyterian church in the Northern Liberties. Fourteen years and more had he served them, and he was honoured of God in building up the church, by increase in the number of their worshippers, and in bringing souls into his kingdom. When he announced to them that he was no longer their pastor, a great sensation was produced, and in the afternoon he laboured to show that the new arrangements were for their good; and finally, to soothe their feelings, it was required by them, that he should continue to preach with them, in exchange with the minister whom they might call. Deeply gratifying to his feelings was the affection manifested, and long was his memory precious among those who heard the gospel from his lips. “The heart of man plans his way, but the LORD establishes his steps.” (Proverbs 16:9 ). 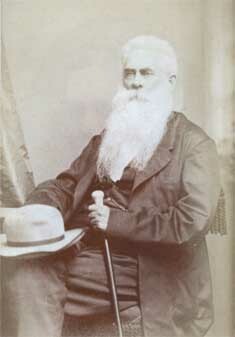 William Swan Plumer was not a name which I had recognized until someone gave me a commentary written by him. It was filled with the rich meat of the Word of God, and I wanted to know more of his spiritual gifts. Born in July 26, 1802 in Darlington, Pennsylvania, William Plumer was of the Scottish heritage. When he turned nineteen years of age, he walked to Lewisburg, Virginia to begin spiritual training at the Academy of the Rev. John McElhenney, known as the Apostle of Western Virginia, where he learned the first fruits of Christian education. Moving on to Washington College in Lexington, Virginia, he continued his studies under Dr. Baxter. Finally, he entered Princeton Theological Seminary in 1825. Two years later, he was licensed to preach by the Presbytery of Orange and began two congregations in Virginia and North Carolina. Ordained in 1827, he began a long series of pastorates in Petersburg, Virginia and Richmond, Virginia from 1830 – 1846. It is interesting to me that he left the south to be at Franklyn Street Presbyterian in Baltimore, Maryland for twelve years. Then for another eight years, he was at Central Presbyterian in Allegheny, Pennsylvania, while teaching at Western Theological Seminary as well. He finished up his teaching call while a professor of theology at Columbia Theological Seminary. He went to his heavenly home on October 22, 1880. He was the preeminent pastor and teacher of the church. He evidently had a voice which stopped people in their tracks to pause and listen. He was a soul-winner par excellence as soul after soul met the Redeemer and were converted. He was a pastor’s pastor as well, and met the needs of his congregations with pathos and sympathy, when that was needed. As a church pastor, William S. Plumer also watched the movements away from the faith once delivered unto the saints. At the 1837 General Assembly, he powerfully made the distinction between the Old School Presbyterians and the New School Presbyterians clear and plain. There was a call to come out and be separate from the entangling alliances which the New School Presbyterians had with the Congregationalists. Thus when the Assembly voted to stop their compromising union, Rev. Plumer had a large part in preserving the Calvinistic convictions of the General Assembly, to say nothing of the biblical basis of Presbyterianism. Words to live by: It is often a case where the people in the pew only recognize the emoluments of a person if he has a string of degrees behind his name and is recognized in the leading organizations of the church. Then a man by the name of William Plumer comes along and we hear and see the Spirit of God residing in a pastor and teacher, and our minds are overcome with what God can do through a mere man. The only qualification which God recognizes in His servants, for loving and obedient service to Him, is faithfulness. Let us be faithful to the Word of God in the places where He has put us.